CHATSWORTH, Calif. - Feb. 26, 2018 - PRLog -- TIG/m, LLC, Modern Street Railways, is finalizing its third self-powered, modern streetcar for shipment to Doha's Msheireb Downtown development. Located in the downtown area of Qatar's capital city, the goal of this pioneering project is to revive Doha's old commercial center. This new smart city development is the largest LEED project in the world at a cost of around $5.5bn. TIG/m was contracted to design, build, operate and maintain the entire three tram system that will operate as a public transportation inside the project site. The goal is to reduce automobile traffic and provide eco-friendly, convenient travel in downtown Doha. "This is a very exciting project for us," said TIG/m President Brad Read. "This project is creating green jobs for our community in California and it furthers our mission of providing sustainable, ecologically friendly transit systems around the world." The tramway network is a single 2 km, closed-loop track system, operating in a counterclockwise configuration. The tramway layout includes nine stops, with a 400M hop-on hop-off zone. The tram service will operate between the hours of 6am to 1am on Sunday to Thursday, and from 1pm to 1am on Friday and Saturday, every day of the year. The TIG/m tram is a single-deck, rigid body, self-powered vehicle. The traction power is provided by onboard batteries operating with a regenerative braking function. Ancillary power is provided by a small on-board generator. The tram system includes state-of-the-art tram priority at all traffic signals and real-time Next Vehicle Arrival signage in the trams and at the stations. 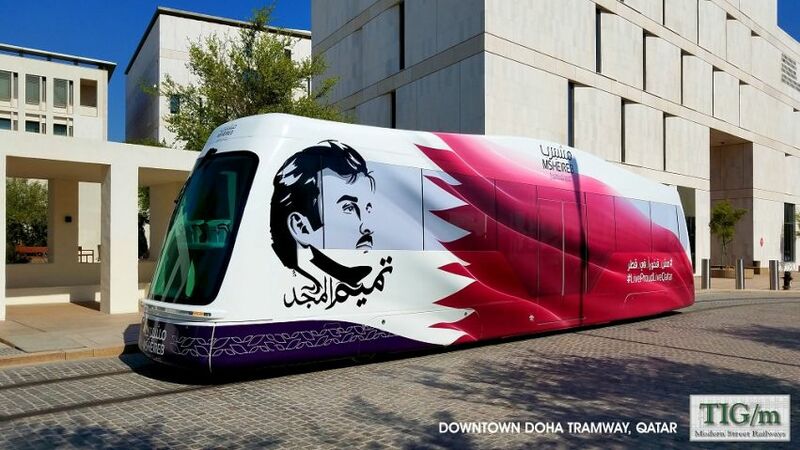 The tram service links all parts of the Msheireb development within 18 minutes with a 6-minute headway at each station, and offers residents and tenants access to Msheireb station, the largest Doha Metro station, which marks the junction of Qatar Rail's three metro lines, the Red, Green and Golden. Established in 2005, the company designs and manufactures pollution-free, self-powered, rail-based streetcars using 95% U.S. made technology. These custom state-of-the-art high-capacity hybrid/electric streetcars are designed for urban public transportation. Powered by a uniquely engineered and integrated self-contained power source that combines lithium iron phosphate batteries, regenerative braking, and a hydrogen fuel cell, the streetcars require no overhead wires, no wayside power, and generate zero pollutants. The project is a flagship project for Msheireb Properties with the goal of preserving the historical downtown area of Doha. Msheireb Properties is a subsidiary of Qatar Foundation.